Dehydrating is a great way to preserve the harvest. When you dehydrate foods, they shrink down in size and you can store a lot more in a very small amount of space. Dehydrating preserves the vitamin content and allows items to last for a long time too. 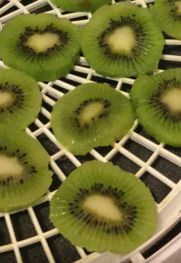 You can rehydrate them and use them as you would any fresh kiwi. Toss dehydrated kiwis into trail mix, oatmeal or just eat them as a healthy snack. 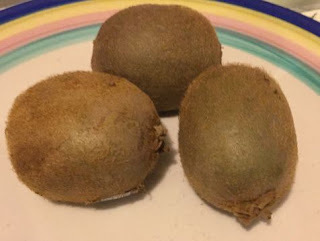 Or you can soak the kiwi in boiling water for about 15 minutes and then add them to cakes or other desserts. Also, did you know that Kiwis have more Vitamin C than even an orange?! Healthy and delicious! To dehydrate the kiwi, just take & peel each kiwi. Slice thin and lay out on the dehydrator trays. Sliced kiwi...I use a mandolin to slice them. 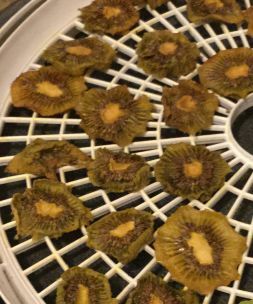 Turn on your dehydrator to 145 degrees and let it run for about 4-6 hours. The kiwis are done and ready to store when they are bendable and a bit chewy. Store in baggies or mason jars like we do. Other fruit I like to dehydrate include: Lemons, Strawberries, and Cantaloupe! 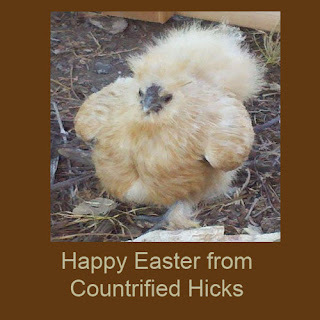 Happy Easter everyone and I hope your day is blessed.